It was an out-of-body experience -- an odd state of euphoria. "Like I was moonwalking on a trampoline." Those were the words Clint Frazier used to describe what it felt like after he banged into an outfield wall for the second time in an exhibition game at LECOM Park in Bradenton on Feb. 24. He remained in that game, playing four-plus innings and finishing 1-for-3 with a single. It was, however, the last game he played for more than two months, as the 23-year-old began to experience concussion symptoms later that evening. "I remember I got turned around and jumped for a ball and caught it, and then I stumbled and hit the back of my head on the wall. But I was fine. It was the third out and I remember running back in and then leading off the next inning and getting a hit," Frazier said. "Then I hit the wall again, but it wasn't my head, it was my left shoulder and I think that's what got me, because I started to feel funny. Still fine, but funny. Like everything just got distorted and not the same as it usually is. "The headaches and the nausea didn't kick in until later that night. I think it was that my adrenaline wore off." From there, Frazier battled those symptoms along with "fogginess" and extreme light sensitivity. He was placed on the seven-day concussion disabled list by the Yankees on March 29, in line with MLB's concussion protocol -- which was established in 2011 and updated as part of last year's collective bargaining agreement. He did not return to any type of game action until April 23, when he played five innings of a game in extended spring camp. But the road that led to the five at-bats he had in that game and where he is today -- batting .328/.399/.595 with 20 extra-base hits in 37 games with Triple-A Scranton/Wilkes-Barre -- was frustrating and arduous. Or, as Frazier puts it: "It's something I really don't wish on anyone." "I had to keep telling myself, 'You don't have a concussion anymore. You're fine. You're fine.'" One of the components of baseball's concussion protocol requires players to undergo baseline neurocognitive testing, otherwise known as ImPACT (Immediate Post-Concussion Assessment and Cognitive Testing). Frazier recalled balancing on each foot with his eyes closed, taking eye tests, looking at lights, needing to remember a handful of different words or images he was told or shown at the beginning of the exam and picking up different items with his left hand and putting them into a specific compartment as quickly as he could. The testing is based on a points system and any player who exceeds a certain point value is immediately shut down and removed from all baseball activity. "It was long, man. And very frustrating. This isn't like any other injury," he said. "If you do something like break a bone or pull a muscle, you get a timetable of when you'll be back. But a concussion isn't anything like that. People hit their head differently. The shock absorbing is never the same for two people, so you never get a timetable. You have no idea when it's going to end." There were also emotional challenges that the outfielder had to grapple with. "I also found out that emotions affect the recovery process and that was really hard to control, too," he recalled. "If you break a bone and get emotional about it, the bone is still going to heal the way it's supposed to. But since this is a brain injury, if you get emotional it disrupts how your mind heals. So I really tried to keep everything positive, but whenever you're getting sent home every single day it's hard to stay positive. Especially if you're getting alienated on your couch every day." Fraizer began seeing independent physician Dr. Anthony Alessi, a UConn Health associate clinical professor of neurology and orthopedics and the director of the UConn NeuroSport Program as well as a consulting neurologist for boxing matches at Mohegan Sun. "He was really great, but, you know, there was only so much he could do. It's not a hands-on process," Frazier said. "But we worked closely and he was really patient with me -- as everyone else was through this process -- as far as completing whatever activity we had planned for that day. If I wasn't up for something that day, or just too tired, there was no pressing. We just came back the next day. "I really suffered through blurry vision early on, and when that started to clear up he was the one who told me to set up the pitching machine and see how well I could track the ball. It helped me get re-used to seeing balls coming in at 95-100 mph. That was really the best eye test for me, and it helped with my confidence when I had to face live pitching again." 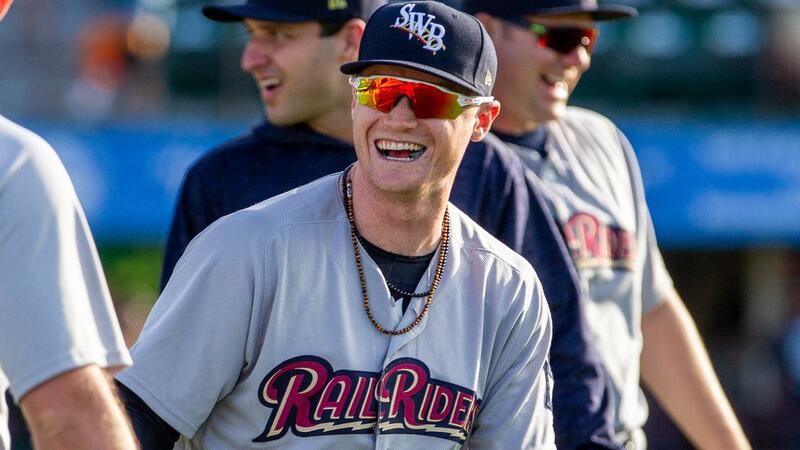 Frazier was assigned to the RailRiders on May 1, following the completion of a four-game rehab stint with Class A Advanced Tampa. Although it didn't show -- Frazier homered and delivered a walk-off hit in his second game back in the International League -- the fifth overall pick of the 2013 Draft was still battling through aftereffects of his concussion. "The hardest thing is really just trusting that it's over," he said. "You know, I think I tried to rush back initially, because our whole outfield was basically hurt or struggling and I just wanted to get out there and help out. But I remember I had a night practice and the noise didn't bother me at all, but the bright lights still got me. I remember my eyes watering a lot and feeling like I was hungover. So I had to cool it for a bit and get re-acclimated to everything. When I was in extended spring everything it was during the day, but since I got back here everything is played under the lights, so that took some time. "Every day got better. It's never not on your mind, though." And as baseball has proven throughout its existence, if there is any uncertainty in the field, the ball will find it. On May 3, Frazier saw his first action in center field at home against Pawtucket, and on the second pitch of the game Rusney Castillo hit a sinking line drive to center that Frazier made a play on. "Oh man, I remember I dove for the first ball in the game and I caught it, but after I thought I was in the outfield feeling some fogginess," he recalled with a chuckle. "But I wasn't. It's just a mind thing. I had to keep telling myself, 'You don't have a concussion anymore. You're fine. You're fine.' And I was. I got through the rest of the game without an issue. "Early on, you feel [too] timid to do something more aggressive, but as I've gotten away from it and played more I'm not thinking about it." Generally, baseball players struggle when they return from concussions. For example, last year Yankees outfielder Jacoby Ellsbury was hitting .281 with a .771 OPS before crashing into the outfield wall and missing a month with concussion symptoms. When he returned, in a span that covered just shy of four weeks, Ellsbury's numbers plummeted to .177 with a .497 OPS. Frazier experienced no such decline. His batting average has never dipped below .250 since his return and has been north of .300 for almost the entirety of the season. The Georgia native believes his success has to do with the meticulous care he was given throughout his rehab and what the process taught him about himself. "I really put an emphasis on diet and routine," he said. "This made me focus on taking better care of myself to make sure the symptoms don't resurface, and diet and routine are a big part of that. If I don't eat properly, I start to feel that fogginess again. And between the traveling schedule and playing every day -- waking up at different times and long bus rides are hard -- locking down a routine is tough. But now I get the proper amount of sleep and have the right food to make sure I'm feeling good. "This game is all about preparation. Preparation is everything. And if you don't feel good enough to do your prep work, it's tough to be successful. That was a really hard part, trusting that you're going to be able to get through the day and do everything you're supposed to. But once you get a little momentum, two or three days in a row, your confidence comes back." Despite missing a chance to break onto the big league roster permanently during the early part of the season, Frazier's restored confidence remains high. He doesn't have any qualms about what might have been, but rather is moving forward with a sense of gratitude and determination. "I think the injury definitely delayed my opportunity to get a chance this year, but I've gone up there twice and I've produced in every game that I've played in [for the Yankees] so I know my turn is coming," he said, referring to his three games in the Majors this season. He's 3-for-8 with a double, three walks, three runs scored and an RBI. "I'm just glad to be healthy and playing baseball every day, whether it's in the big leagues or at Triple-A. But I know I'll get my chance, just like the rest of that [RailRiders] locker room will, too."